The Canadian Forces have built a camp for asylum seekers that are on the Quebec Border. Asylum seekers are currently being held there. This was done to help accommodate these people. 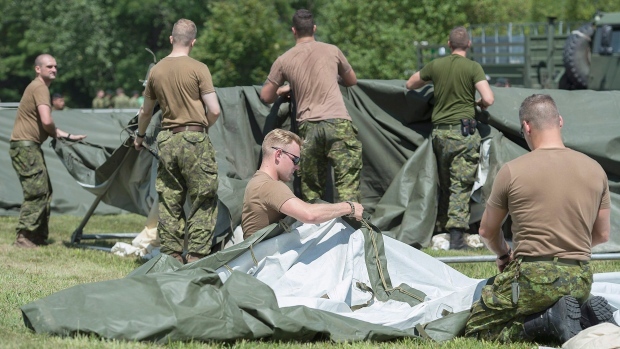 The military is building the camp at Saint-Bernard-de-Lacolle in Quebec. The camp itself will have tents of course. There might be heating and even lighting. The camp can house up to 500 people. This is an announcement that some might enjoy hearing because there's a lot of asylum seekers coming into Quebec right now. These people that are coming in are crossing into Canada via unofficial border check points. However, the RCMP (Royal Canadian Mounted Police) have indeed set up a tent to help with the new people coming over. The military did mention that most of the soldiers aiding in the set up of the tents will go back to their home bases once it's all arranged. The military will also not be participating in law enforcement tasks and security tasks. The Canadian Forces has a history of helping people. They have helped with wildfires, search and rescue, and floods before. It does not come to a large surprise that they're building a small camp to house the incoming asylum seekers for the time being. Many of the asylum seekers are of Haitian decent. Some of them now face deportation and are fleeing to Canada. They might get deported because President Donald Trump is not going to extend the temporary protection status for Haitian nationals. It is set to expire in January. This protection status started in 2010 after the terrible earthquake in Haiti. However, the Department of Homeland Security now thinks Haiti is a safe place. The Montreal French-language school board is preparing for students to be put into courses by the end of the month. This will mostly be children going into these courses. There's another location being used to house asylum seekers and that's the Montreal Olympic Stadium. Apparently, the Royal Victoria Hospital will be opened to new arrivals as well. Francine Dupuis who works with PRAIDA said the building can help accommodate 320 more people. He also mentioned in a news conference that not all shelters are currently full yet, however, to deal with the continuing influx they need more space. A spokesperson for the CBSA (Canada Border Services Agency) Patrick Lefort, said that 700 people are currently waiting to be processed and that the wait is around 2-3 days. There is also apparently no beds and just chairs and benches.